There’s no doubt that Henderson is home to some pretty incredible bird species. Legendary naturalist John James Audubon spent years in Henderson observing and painting many works that would become his famous Birds of America. Luckily we don’t all have to be expert bird enthusiasts to enjoy nature as Audubon did. But if there is one bird we all can appreciate, it is our nation’s bird, the majestic bald eagle! This riverfront park is located off of Water Street in Henderson. This is a popular pace that locals can enjoy serene views from a swing and a nice calm stroll. If you are wanting to spot an active eagle, we suggest going in the morning time. Last summer we spotted a bald eagle around 8:30 a.m. perched in the large tree at the end of the sidewalk where the path circles around upon itself. Eagles tend to be active and hunt along the river during the early morning hours and as late at 11:00 a.m. There are a few park benches located on this sidewalk if you decide to sit and wait or watch for a while. Many locals make their way to Red Banks on foot by way of the River Walk, a paved walkway which extends from our Riverfront Boat Ramps to Atkinson Park. If you are traveling by car, you can park in the lot right beside Red Banks Park. The address for Red Banks Park is 611 Merritt Drive, Henderson, Kentucky. If you want a greater chance of spotting one or multiple eagles, we would recommend a visit to the new Wetlands addition at John James Audubon State Park. 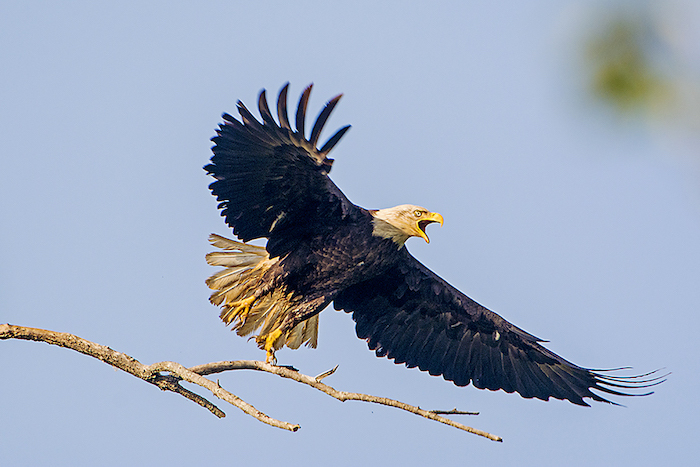 The area that locals frequently spot nesting bald eagles isn’t as prominent as Red Banks Park, but we can tell you how to get there! Continue on Wolf Hills Road for no more than a mile, you will be looking for pull-off area to the left of the road. Keep your eyes open for a section of the road that has a dirt area next to a guard rail that sits about 10-12 feet back from the edge of the road. (You’ll know you’ve gone too far if you see a gravel entrance to the wetlands on your left.) Approach cautiously as you pull off on the side of the road, as there is limited parking and there may be other birdwatchers and traffic around. This is where most people would recommend going to view bald eagles. Eagles tend to stop hunting and return to their roost in the late afternoon. If you arrive and find that the eagles are not active or maybe there are just too many cars parked, continue down the road to the Wetlands entrance we mentioned above, and you can walk the Wetlands Boardwalk and other trails that are near to the Ohio River. We have spotted many deer tracks in this area so don’t be surprised if you see other wildlife besides the eagles! A visit to John James Audubon State Park after some eagle watching is great if you want to learn more about other birds in the area or if you have time to spare after your eagle watching. There is an excellent display of museum artifacts and art and a bird observatory, as well as many networks of trails throughout the park that range from easy to advanced. Nothing beats being relaxed among nature! If you’re looking for more than a couple of hours of relaxation, book one of the six cozy cabins in the State Park or take advantage of the RV camping site. Whether you spend a couple hours or a couple days here, you really can’t go wrong! For more information on John James Audubon State Park and other outdoor adventures in Henderson, click this link to get a copy of our Travel Guide.